20.58 IST: Mandeep Singh to Nitish Rana, SIX! This one is high and handsome! Mandeep runs in from ’round the wicket and angles in a short ball on off. Rana stays back and launches it over mid-wicket for a biggie. 20.57 IST: Mandeep Singh to Robin Uthappa, FOUR! Mandeep with his gentle speed dares to bowl it short and wide outside off. Robin attacks it with all his power and whacks it through point. 20.54 IST: R Ashwin to Nitish Rana, SIX! Into the stands! Second in the over! This is tossed up wide outside off. Rana gets to free his arms, he connects really well and it sails over long off. 20.53 IST: R Ashwin to Nitish Rana, SIX! A gift but it still has to be put away! A full toss and Rana deposits it into the mid-wicket stands with a slog sweep. A maximum of Ashwin’s each over seems to be mandatory tonight. 20.45 IST: R Ashwin to Nitish Rana, SIX! Slightly short and that has been powered into the stands. Rana transfers his weight onto the back foot and hits it over the long on fence. 20.35 IST: R Ashwin to Nitish Rana, SIX! In the slot and that is out of here. Flighted ball and on off, Rana goes down on one knee and hits it over the long on fielder. 20.32 IST: Varun Chakravarthy to Robin Uthappa, FOUR! Second boundary in the over. This time through the right of point. Short and wide again, Uthappa says thank you very much as he cuts it for another boundary. 20.31 IST: Varun Chakravarthy to Robin Uthappa, FOUR! 29 from his first 7 balls. Poor start for the debutant. Another poor delivery this. It is short and outside off, Uthappa rocks back and cuts it past point. It races away to the fence. 20.28 IST: R Ashwin to Robin Uthappa, SIX! Uthappa has belted this one out of the park! He goes down on one knee to a full ball, fetches it from outside off and powers it over mid-wicket for a maximum. 20.27 IST: R Ashwin has the ball for KXIP now and guess what? Rana is well within his crease at the non-striker’s end. 20.22 IST: Andrew Tye is the new man in with the ball for KXIP. 20.21 IST: Hardus Viljoen to Robin Uthappa, SIX! A flat maximum! What a shot! Slightly short and width on offer outside off. Uthappa pounces on it as he slaps it hard. The connection is such that it carries all the way. A biggie to end a successful over for Punjab. 20.20 IST: Hardus Viljoen to Sunil Narine, OUT! In the air… taken! Both the openers are now back in the hut. Another skier has been pouched, this time by KL Rahul. Suddenly now, Kolkata are in a spot of bother. It is once again the short ball which does the trick. It is on the body. Narine looks to pull but only manages a top edge. It goes behind Rahul who turns and runs across to his right, initially he seems to misjudge it but then takes it by stretching out his hands near short fine leg. Viljoen makes an impact straightaway and the bowling change has worked wonders here. 20.17 IST: Debutant Hardus Viljoen is on now for Punjab. 20.14 IST: Mohammed Shami to Sunil Narine, DROPPED! A really tough one for the bowler. 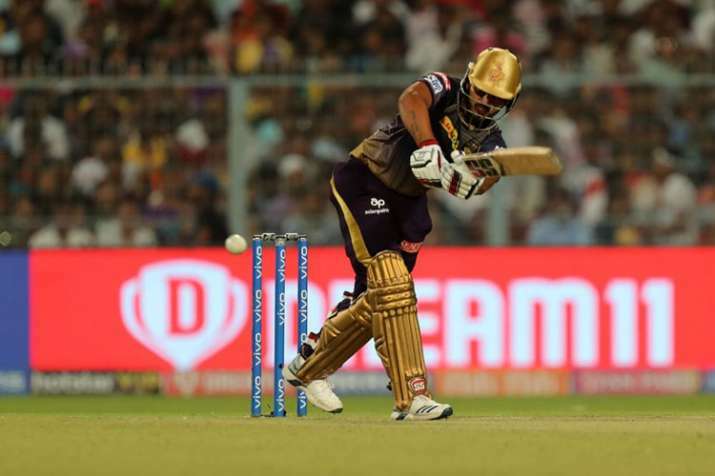 Short and on off, Narine stays back to flat-bat it down the ground but fails to connect properly. Still he hits it with a lot of power and Shami drops it in his followthrough. Would have been a great catch and even greater moment for Punjab to get both the danger men within two balls. 20.14 IST: Robin Uthappa is the new man in. 20.13 IST: Mohammed Shami to Chris Lynn, OUT! Shami gets his revenge! It’s a brilliant catch from David Miller. A shortish ball again, it’s around off, Lynn sticks back to power it across the line again but it catches the top edge and goes high up in the air. Miller calls for it from extra cover and completes the catch next to the pitch, to be precise. A big breakthrough, this. 20.11 IST: Mohammed Shami to Chris Lynn, FOUR! Clubbed away! Nearly took the head of his partner at the other end. Shami goes short and wide outside off, Lynn packs a punch and powers it over Narine for a boundary at long on. 20.10 IST: Mohammed Shami to Chris Lynn, FOUR! Lynn joining the fun! A little bit of width on offer outside off, the Aussie latches onto it and slams it over cover-point for a boundary. 20.09 IST: Varun Chakravarthy to Sunil Narine, SIX! Consecutive maximums! 25 from Varun’s first over. Welcome to the Indian T20 League. Another delivery which is asking to be hit. Down the leg side, Narine whips it over the square leg fence for another biggie. 20.08 IST: Varun Chakravarthy to Sunil Narine, SIX! He has picked the bones out of that one. That is colossal. Goes down on one knee and slog sweeps it. It is right off the middle and it sails into the mid-wicket stand. 20.08 IST: Varun Chakravarthy to Sunil Narine, FOUR! Poor ball and put away! Short and on middle, Narine rocks back and pulls it all along the ground through mid-wicket. Long on runs to his left, dives but fails to stop it. 13 from the first 4 balls. Pressure on the debutant. 20.07 IST: Varun Chakravarthy to Sunil Narine, DROPPED! A very, very difficult chance that! Another flighted delivery and it is full again. Narine this time looks to go to the left of the bowler. He hits it uppishly and powerfully. Varun sticks his hands out but fails to hang on. It goes wide of long on and the batters take two. That needed to stick and this time it did not. 20.07 IST: Varun Chakravarthy to Sunil Narine, SIX! All the way! Narine does not want a sighter against the debutant. He straightaway goes after him, Varun is guilty of bowling it too full. Narine thumps it over the long off fence for a biggie. First for the game and Narine is off the mark in style. 20.06 IST: Varun Chakravarthy to bowl from the other end. 20.04 IST: Great first over from Shami. Just one run coming off it. 19.58 IST: We are all set for the action to begin. Andre Russell rings the bell and then, the umpires make their way out. The Punjab players are in a huddle. Now they make their way out to the middle. Behind them walk the Kolkata openers, Chris Lynn and Sunil Narine who is back at the top of the order. 19.33 IST: KXIP’s mystery spinner Varun Chakravarthy will make his debut.
.@ashwinravi99 calls it right at the toss and elects to bowl first at the Eden Gardens. 19.26 IST: Who are you rooting for? It’s #KKR v #KXIP at the Eden Gardens.